Giant gators aren’t the only reptiles wandering onto Florida golf courses. 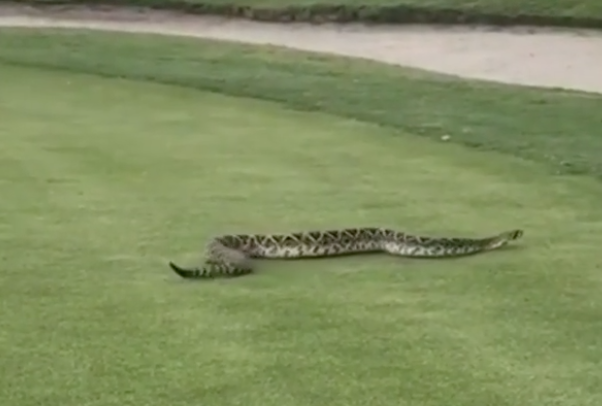 According to Fox 13, a friendly game of golf was interrupted yesterday when a large rattlesnake slithered by the 14th hole at the Mangrove Bay and Cypress Links Golf Course in St. Petersburg, Florida. Logan Ungerer, one of the golfers, is the brave soul who approached the snake and took a video for his Instagram which has since gone viral. Although it is difficult to pinpoint exactly how large the snake in the video is, the Eastern diamondback is known to be the largest species of venomous of rattlesnake with an average length of 3-6 feet. According to the Florida Fish and Wildlife Conservation Commission, diamondback rattlesnakes can be found right here in the Sunshine State in areas that contain palmetto thickets. According to the Centers for Disease Control and Prevention, around 7,000 to 8,000 people are bitten by venomous snakes in the United States per year, and although not necessarily lethal, a bite from a diamondback will definitely land you in the hospital with some ugly swelling, vomiting and bruising. Diamondbacks can strike at prey from a distance more than half their length, meaning that it probably isn’t a good idea to try and snap a pic up close and personal, no matter how many likes it’ll get you.